Hollister Restore Calcium Alginate Silver Dressing is a highly absorbent alginate dressing with ionic silver complex, an effective antimicrobial agent that works against a broad spectrum of microorganisms including MRSA, VRE and fungi for up to 14 days. 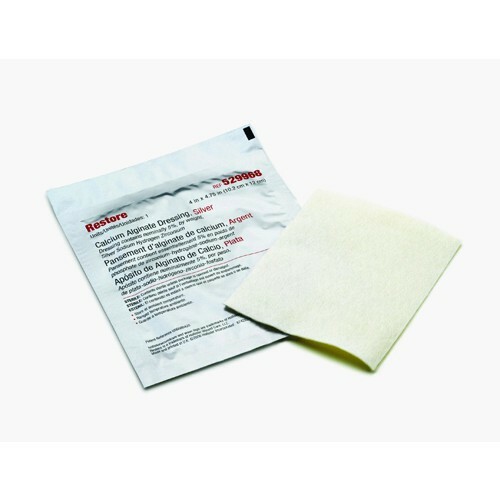 Restore Calcium Alginate Dressing with Silver helps maintain a moist wound environment by creating a malleable, protective gel when in contact with exudate. Restore with Silver is indicated for moderately to heavily exuding partial and full-thickness wounds, and comes in 2 x 2 inch (Hollister 529967), 4" x 4.75" inch (Hollister 529968), dressings and 12 inch rope (Hollister 529969).